I think that one of the greatest gifts of the Bible is the capacity of the stories it holds to reveal truth far beyond an obvious meaning. Maybe I’ve been reading too many parables lately. Parables aren’t just stories with an obvious point, they’re meant to offer insight into Jesus’ revolutionary way of looking at the world. The Good Samaritan, for example, isn’t just a story about someone helping someone else. That’s a good idea in itself, but look a little closer and you’ll see the truth is that the person who stopped was someone the first audience for that story wouldn’t have expected, someone who their society says shouldn’t have stopped. That’s the kind of love Jesus was teaching: everyone is your neighbour, especially those you’re not supposed to love. Dig deeper and you might have more questions about the other characters in the story, too. Look from a different angle, a different perspective, and maybe you’ll find more than you thought. I think all the stories of Jesus are like that. This week, I’m looking at the story of Jesus being anointed with expensive oil by a woman. That sounds like a bare bones summary because it is. The story appears in all four gospels, but each telling has different features and there’s even some debate as to whether it’s the same incident. That’s worth looking into another time, but I’m looking at the Gospel of John right now, where the story is placed in a very unique context (John 12:1-11). The two obvious points to this story seem to be the anointing and the place of the poor. The latter may sound like Jesus is condoning poverty (he’s not – he’s once again pointing out a societal flaw) and the former shows Mary foreshadowing Jesus’ death. Somehow, Mary knows what’s ahead next week and makes this extravagant gesture of love and devotion. Sure, and that’s important. But, hang on a minute: let’s look the other way. Let’s look back for a moment. It’s Jesus who interprets Mary’s actions. She doesn’t say why she’s doing it. 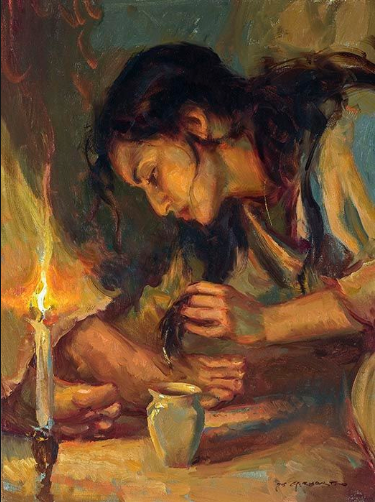 And “it” was something truly outrageous: not only did she poor costly oil on Jesus’ feet, but she wiped them with her unbound hair. Touching a man and undoing her hair in public were things that were just not done. Yes, that’s an extravagant, even outrageous, act of love, but maybe it isn’t just about death. What if Mary was expressing her gratitude for the return to life of her dear brother Lazarus? That story immediately precedes this one, separated only by the pharisees planning to kill Jesus and Jesus retreating from the public eye. The dinner itself might even be honouring Jesus for giving them Lazarus back. Mary’s actions would then be about celebrating life, not honouring death. Mary thanks Jesus with her own radical act of love, just as Jesus’ own radical act of love raised Lazarus. Here’s the thing, though. I’m not suggesting for a moment that this is an “either/or.” It’s an “and.” Lazarus was dead and is alive again, Jesus will soon be dead and alive again. Perhaps a further thought here is reflecting on how death is a part of life, that death and life are part of our everyday. Each day we encounter experiences of beginnings and endings, the end of a life and the birth of another, the natural inclination of creation to grow and to die, the movement of the seasons, even the day itself. There are moments of grief and celebration coming in all shapes and sizes. And how will we handle that? Do we avoid the one that makes us uncomfortable and just try to push past it, living only in the one that seems easiest? Life is not simply preparation for death and the life to come. Nor is death and grief something we can avoid. Jesus embraced both with love and experienced them to the fullest. There’s more to life than death. Ask Lazarus.